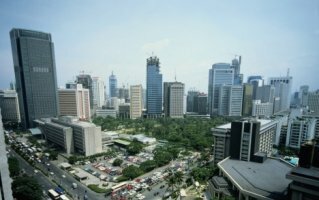 The Philippines is currently one of Asia's fastest growing economies. However, major problems remain, mainly having to do with alleviating the wide income and growth disparities between the country's different regions and socioeconomic classes, reducing corruption, and investing in the infrastructure necessary to ensure future growth. Primary exports of Philippines include semiconductors and electronic products, transport equipment, garments, copper products, petroleum products, coconut oil, and fruits. A newly industrialized country, the Philippine economy has been transitioning from one based upon agriculture to an economy with more emphasis upon services and manufacturing. The Philippines is the world's largest producer of coconuts and pineapples. Coconut production in the Philippines is generally concentrated in medium-sized farms. Rice production in the Philippines is important to the food supply in the country and economy. The country is the 8th largest rice producer in the world, accounting for 2.8% of global rice production. The Philippines is one of the largest producers of sugar in the world. The Philippines is a major player in the global shipbuilding industry with shipyards in Subic, Cebu, General Santos City and Batangas. Subic-made cargo vessels are now exported to countries where shipping operators are based. Aerospace products in the Philippines are mainly for the export market and include manufacturing parts for aircraft built by both Boeing and Airbus. Moog is the biggest aerospace manufacturer with base in Baguio in the Cordillera region. The company produces aircraft actuators in their manufacturing facility. The country is rich with mineral and geothermal energy resources. Philippine gold, nickel, copper and chromite deposits are among the largest in the world. Philippines also exports electronic products, computers, other manufactures and woodcrafts and furniture. Philippines is also the world's largest producer of coconut, pineapple and abaca. Major export partners of Philippines are Japan, the United States, China and Hong Kong. The economy of the Philippines is the 39th largest in the world, according to 2014 International Monetary Fund statistics, and is also one of the emerging markets. The Philippines is considered as a newly industrialized country, which has been transitioning from one based on agriculture to one based more on services and manufacturing. The economy is heavily reliant upon remittances from overseas filipinos, which surpass foreign direct investment as a source of foreign currency. Despite constraints, service industries such as tourism and business process outsourcing have been identified as areas with some of the best business opportunities for growth for the country. The Philippines is a member of the World Bank, the International Monetary Fund, the World Trade Organization (WTO), the Asian Development Bank which is headquartered in Mandaluyong, the Colombo Plan, the G-77 and the G-24 among other groups and institutions. Philippines is a net importer but it is also a creditor nation. The Philippines is one of the largest rice importers. Rice is the most important food crop, a staple food in most of the country. Philippines major imports are electronic products, mineral fuels and transport equipment. Major import partners of Philippines are China, the United States, Japan, Taiwan, South Korea, Singapore, Thailand, Indonesia, Saudi Arabia. 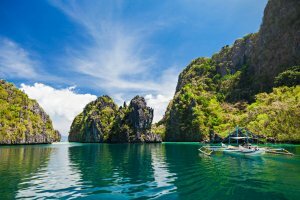 The Philippines is an island country situated in Southeast Asia, in the western Pacific Ocean, bordered by Taiwan, Vietnam, Malaysia, Indonesia, the Philippine Sea and Palau. With a population of about 100 million people, the Philippines is the seventh-most populated country in Asia and the 12th most populated country in the world. Philippines is a member of the Association of Southeast Asian Nations (ASEAN), Group of 24, International Chamber of Commerce, International Monetary Fund, World Customs Organization, WTO and other international organizations. Single-column tariff based on the Harmonised System (HS), an international product nomenclature formed under the auspices of the World Customs Organisation, developed for customs purposes, the collection of trade statistics and all kinds of transactions in international trade. Most duties are ad valorem, assessed on the export value plus insurance and freight charges. An ASEAN margin of preference on the existing tariff is negotiated periodically on a product-by-product basis. The Philippines is a member of the Association of South East Asian Nations (ASEAN) and preferential rates are applied to imports from other members. A value-added tax (VAT) of 12% is levied on the sale of goods and services and on the imports of goods into the Philippines. The VAT on imported goods is based on the total value used by the Bureau of Customs in determining tariffs and duties. Exempted from payment of VAT are, among others, agricultural and marine food products in their original state and breeding stock and genetic materials. asphalt and petroleum and other fuel products. Importation of agricultural products is allowed subject to quarantine requirements. Used textiles/garments remain prohibited imports. Chicken, beef, pork and lamb are allowed into the country provided the necessary import permits are obtained from the Bureau of Animal Industry. There are no protocols in place for the importation of game meat such as crocodile, kangaroo and emu. Applications for the issuance of a special permit for the one-time importation of game meat will have to be lodged with the Bureau of Animal Industry. Regulated imports include goods restricted for reasons of public health and safety and protection of domestic industries. The Philippine Government uses the transaction value system of import valuation in compliance with the World Trade Organization (WTO) agreement on customs valuation. This system looks at the price agreed upon by the buyer and seller, including other payments made by the buyer for the goods as purchased. higher risk are assigned to the 'red lane' and undergo documentary and physical inspection. should be among the top 1000 importers in terms of duties and taxes paid. a letter of credit will be opened by the Central Bank or its agents upon presentation of the proforma invoice. name and address of importer or distributor. Drugs must be labelled with the product's generic name and must appear above the brand name, in a larger typeface, enclosed in a border with a contrasting background. Failure to comply with any part of the above regulations is subject to penalty. Goods not bearing adequate marks of origin are subject to a marking duty of five per cent. Packing should be secure and guard against tropical dampness and heat. Contents should not be indicated on outer containers. The use of rice, straw and chaff is prohibited. Excluding shipments of over 500 barrels or cases, all packages and cases in each shipment must be numbered consecutively. Animals and animal products of cattle, sheep, swine and goats require a certificate of ante- and post-mortem inspection. Imports of livestock, meat and meat products, plants and plant products must be accompanied by health certificates issued by the approved authority in the country of origin. A Sanitary and Phytosanitary certificate, issued by the approved authority in the country of origin, accompanying imports of plants and plant products, must be forwarded to the plant quarantine authorities at the port of entry. Food, drugs, pharmaceuticals and cosmetics require certification that the items comply with Philippine specifications. This is in the form of a declaration by the shipper and must be filed with the Philippines Consulate. Insecticides, Paris greens, lead arsenates and fungicides require a declaration by the manufacturer or shipper that the goods are not falsely labelled and are not dangerous to health. Chemicals and chemical products must be accompanied by a certificate indicating the specific chemical name. Trade names should also be included. The Philippine Food Fortification Law requires that all staple foods such as rice, sugar, flour, salt and cooking oil – be fortified and has identified Vitamin A, iron and iodine as the three most needed micronutrients in the country. The law aims to provide 50 per cent or more of the recommended daily allowance (RDA) of Vitamin A and iron among at risk groups, particularly children below six years old and women of reproductive age. This law applies to all manufacturers or producers, importers, traders, tollees, retailers, repackers of staple foods as well as restaurants and food service establishments. Sanctions for non-compliance include fines of not more than P1 million and revocation of permits and licenses depending on the gravity of the offense. Essences, flavouring extracts and other preparations containing distilled spirits (ethyl alcohol) require a certificate giving the source and percentage content of the alcohol used in the manufacture. Product registration with the FDA can take anywhere from three to six months, provided documentation is complete. Certificate of free sale - if requested the certificate should be issued by a responsible government authority in the exporting country stating that the products are sold freely in that country and must be legalised by the Philippine consulate. Export entry - to be submitted only when specified in the letter of credit. If so specified, five copies are required. Fax signatures are not permitted. At least three signed negotiable and five non-negotiable copies are required. One negotiable and four non-negotiable bills are to be included with the original documents. One negotiable copy stamped 'For consular purposes only' together with one non-negotiable copy are to be presented to the Consulate. The bill of lading must show gross weights, quantity and volume (in kilograms), freight and other charges. Five copies are required and must be certified by seller, manufacturer, exporter or his duly authorised representative. Stringent regulations apply to food, drugs and pharmaceuticals, insecticides, fungicides and essences and flavourings containing distilled spirits. The requirements for specific products should be checked with the importer. Health certificates issued by the approved authority in the country of origin must accompany imports of livestock, meat and meat products, plants and plant products and chemical products. Import permits issued by the appropriate Philippine Government agency are required for a number of specified items. Normal commercial practice. However, advice should be obtained from Philippine importers and insurance companies. The legal units of measurement in the Philippines is based on the metric system or the SI (International System of Units). The use of the metric system is further reinforced by the Consumer Act of the Philippines.